The ITTF has decided that the new plastic ball will be introduced in ITTF competitions from July 1, 2014. The ETTU has recently confirmed the mandatory use of the plastic ball in all ETTU competition from September 1, 2014. As a matter of principle Table Tennis England supports the decision and will be introducing the new plastic ball this coming season. We wish to accommodate our players across the membership spectrum, be sensitive to the logistics of all those who are planning for next season, while not disadvantaging our elite athletes who will also be competing at the highest level here and abroad. We all recognise, along with other national associations, that this will be a transitional year. We understand that a reasonable supply of plastic balls will be available in the UK from mid-late July however we are keeping a watching brief and should there not be sufficient supply by then we will issue further guidance in particular with respect to the first two Grand Prix. Table Tennis England expects and encourages increased use of the plastic ball as the supply becomes more available but recognises the practical difficulties during a transitional year. Therefore apart from the above competitions, it will allow those responsible for all other aspects of Competitive Table Tennis (as defined in Regulations) to choose either celluloid or plastic balls until July 1, 2015 when use of the plastic ball will become mandatory for all Competitive Table Tennis in England. As part of our redevelopment as a national sport governing body fit for the 21st century, you will be aware of the changes we have made to date...a new senior management team, new premises, new Board structure, new departments, new regulations, new regional developments, new talent development plans,........and now we have a new name and image. Table Tennis England was launched on the May 19, 2014. We want to be easily identifiable to people outside the table tennis world, as well as reconnect with those who participate in our clubs and leagues. Table Tennis England, our logo and rebrand will do that. Over the next few months there will be a continuing process of change as our new logo and brand is phased in...and new projects and initiatives appear. Head of Marketing and Communications Gerry Cronin has written an article about the new brand. It explains more about our redesign, literature and logos which are available to leagues and clubs, advice on using the new brand, how you can contact people via new email addresses, how you can be involved in this process and who to contact for more information. The England squad of Liam Pitchford, Paul Drinkhall, Daniel Reed and Sam Walker reached the final of the challenger division to clinch promotion back to the championship division after an absence of 17 years. They then added the divisional title by beating Italy in the final. Unfortunately, the women’s squad of Joanna Drinkhall, Kelly Sibley, Tin-Tin Ho and Hannah Hicks were unable to make it a double celebration as they were eliminated in the quarter-finals. Tom Jarvis continued the winning ways for England players by claiming victory in the Spanish Youth Open. The 14-year-old from Skegness took the Cadet Boys’ Singles title, beating Denis Ivonin of Russia 3-1 in the final. It matched the achievement of Paul Drinkhall, who took the singles title at the senior Spanish Open the previous month. While our cadets were triumphing in Spain, our more senior players were taking the medals on the other wide of the world in the 14th World Veterans Championships in New Zealand. Our veterans won a collection of gold, silver and bronzes in age events ranging from Over 40 to Over 85. European champions Paul Davies and Rob Davies produced a great performance at the Slovakian Open to take gold in the men’s class 1 team event. There were also medals for Will Bayley/Paul Karabardak (men’s class 7 silver), Aaron McKibbin with Belgium’s Marc Ledoux (men’s class 8 silver), David Wetherill with Valentin Kneuss from Switzerland (men’s class 6 silver) and Jane Campbell/Sara Head (women’s class 1-3 bronze). The GB Para Table Tennis Team also picked up medals in the singles with Paul Davies (class 1) and Jack Hunter-Spivey (class 5) taking silver and Rob Davies (class 1) and David Wetherill (class 6) finishing with bronze medals. The GB Para Table Tennis Team also struck gold in Slovenia as Will Bayley (class 7) and Rob Davies (class 1) took gold in the singles and there were also bronze medals for Paul Davies (class 1), David Wetherill (class 6) and Jane Campbell (class 3). Congratulations to Alex Mercer, who has been chosen as one of the umpires for the Youth Olympic Games in Nanjing in August. Susie Hughes has been elected unopposed as the new Deputy Chair of Table Tennis England. Susie was previously on the Board as Vice Chairman of Communications. She plays table tennis in Liverpool and Southport Leagues, as well as VETTS events and British League. The vacancy on the Board will be taken by Simon Griew who becomes a Non-Executive Director. Simon has more than 25 years’ experience in the energy industry, is managing director of his own consulting company and has played table tennis for many years, competing in the Leamington and Coventry leagues and representing Warwickshire in the Veterans’ County Championship. The first few weeks of this year have been mixed with emotions at the ETTA. First, as I am sure you will have heard by now, our Chairman Andy Seward passed away suddenly on January 15. A few days later we received the good news from Sport England that we had made sufficient progress in our governance, structure and organisation that we merited further financial investment in the future. It was this landmark decision which Andy had worked so hard towards. In his six months as Chairman, he led his team to initiate and implement the change and reform which would guarantee the future of the sport. Our pleasure at hearing this good news was tempered by the sadness that Andy did not see the results of his efforts. He has left a lasting legacy to table tennis in this country and will be missed by all who knew and worked with him. Andy's death means that the ETTA must seek a new Chairman. That process is now underway. Counties and Leagues have two weeks to nominate a candidate, after which, if it is contested, there will be an election. Next month (March) sees the start of the second phase of change. We are moving to a new head office in Milton Keynes and have streamlined the structure of the organisation with the creation of four new departments and four new senior managers to oversee them. This will enable us to concentrate on delivering participation and performance to existing and future table tennis players. This work will not happen overnight and we still have many challenges to face. I am pleased to have accepted the post of CEO on a permanent basis and am looking forward to working with our new team and volunteers to make table tennis a success story in England. In the last newsletter, we referred to the creation of four new areas which would replace the existing nine regions in terms of the staff base for their work of grass-roots development, participation and coaching. This would allow us to make better use of our resources with bigger teams offering support across a wider area. Work is already under way within these new areas. Meetings have taken place to look at the strategies of these new teams in identifying development and coach education. Regions continue to play a very important role within the areas not least through the work of Regional Committees. We are also working with our valued volunteers within the existing regions to maintain the momentum of regional coaching and competition. Part of the our new approach is the creation of four Talent Development Centres (as reported last time). We are working in partnership with four clubs, providing coaching, a development structure and facilities to identify and nurture new talent. These are up and running now and we will continue reporting back as we seek out and develop the talent of the future. An increase in funding by UK Sport for Para Table Tennis has provided a significant boost for the GB Para Table Tennis Team, rewarding its recent successes and also recognising the potential within the squad. Schools in and around London have received a boost with a new grant from the Jack Petchey Foundation which will provide more than 200 new tables for school children to learn and develop their table tennis skills. The race for Commonwealth Games places in Glasgow 2014 began in earnest in with nine English players starting their 2014 international campaigns at the Hungarian Open in Szombathely. Andrew Baggaley fared best among the men with a place in the last 16, while Kelly Sibley made the last 32 in the women's event. The premier domestic event, the English Senior National Table Tennis Championship, will take place at Ponds Forge International Sports Centre, Sheffield from February 28 - March 2, 2014, with several of the top players in England participating. Tickets are available in advance. The entry forms are available for this season’s English League Cup Competition - the Wilmott Cup (Men), JM Rose Bowl (Women), Carter Cup (Junior Boys) and Bromfield Trophy (Junior Girls). All entries must be endorsed by a Local League. The ETTA publishes, and regularly updates, a calendar of tournaments and events through to June 2015. 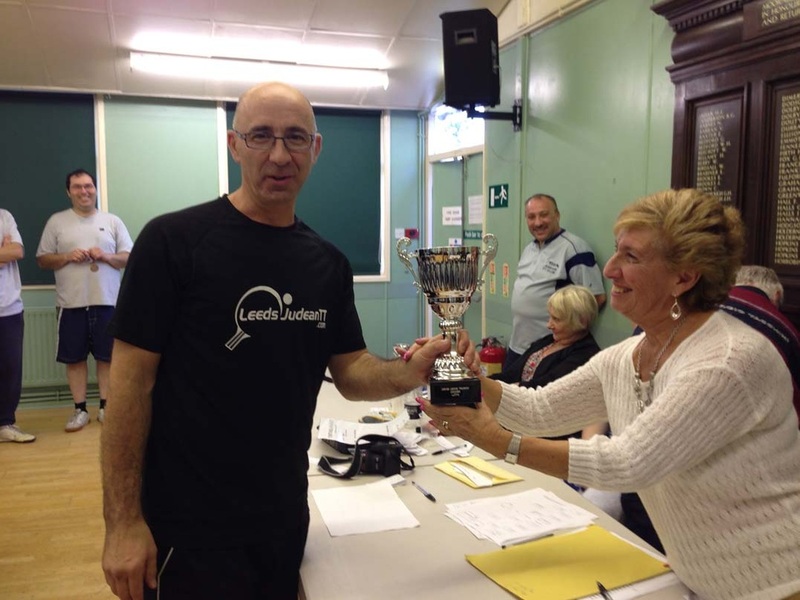 The Leeds Judean Table Tennis Club would like to extend their sincere condolences to Andy Seward's family on his untimely death. A very merry Christmas to all who celebrate, very best wishes to all members for a good new year. Special congratulations to Ashley who has just become a father (again). Another prospective member of the club! In this newsletter, I would like to explain the changes we are making and put them into the context of the future of English table tennis. As previously, I will highlight the information here and provide links back to the ETTA website for those of you who wish to have more information on each topic. It is 12 months since English table tennis was given notice by our major funders, Sport England, to put our house in order. We were one of only six sports out of nearly 50 who failed to achieve the usual four-year funding commitment. It was a major blow and left us with an uncertain future. It was made it clear that there had to be major changes to the governance and structure of the ETTA and the way in which it administered table tennis in England, if there was to be any guarantees of further funding. The ETTA was given a short-term allocation of funding to see us through one year and £8 million was held back dependent on evidence of improvement. Now, we have our first real test. This month members of the ETTA Board are making our case to Sport England, after which we will find out if we have made sufficient progress to merit a further tranche of funding. When I became Chairman of the ETTA six months ago, I was certain that we needed to start again from the beginning, not be afraid to pull apart what had existed in the past, re-examine every aspect of the way we operated, and rebuild our organisation from the ground up. I brought in a new team on the ETTA Board of people who are linked to table tennis as players, umpires or organisers, but also who possess the necessary professional skills and experience to oversee a national sports governing body during a radical upheaval. We also appointed the right person to head the organisation and deliver this change management as our new CEO, Sara Sutcliffe, who can combine her legal, personnel and sporting background to drive the organisation into the future. At our first National Council meeting, I was pleased with the huge support from National Councillors who voted that they take a more advisory and liaison role and hand over the policy-making power to our new Board. Before we could look to the outside, we needed to take a long, hard look at our own organisation. The ETTA's location in Hastings was not fit for purpose...and is in fact due to be demolished next year. We have looked to the future and decided to move to a new purpose-built administrative head office combined with on-site playing facilities in Milton Keynes. We also needed to look at the way the ETTA operated, both in head office and in the field. We have now divided our operations into four distinct areas of responsibility and are currently recruiting four senior managers to take on responsibilities as Head of Coaching and Performance; Head of Development; Head of Operations; and Head of Marketing and Communications. This will give us a more focused direction under a senior management team. As well as changes in our head office structure, we have looked at changes in the field. We had been operating in nine distinct regions and this was not making the best use of our resources, as there were many incidences were these units were operating in isolation and best practice was not necessarily common practice. We are now creating four larger areas, in line with the Sport England approach. These areas will have bigger teams who can offer support across a wider area. Part of this process is the creation of Talent Development Centres, where we will highlight, develop and nurture young table tennis talent across England. Funded by Sport England, the first four Talent Development Centres will operate as a partnership between the ETTA and local clubs. A leading table tennis coach in each location will be tasked with the implementation of this ambitious talent development programme. This robust system will bring high quality coaching and access to the right environment for our young, talented players as they set out on the right road to future successes. All of these changes will work alongside our significant and valued volunteer network. Be assured, we do not underestimate the contribution our volunteers make to English table tennis. These are difficult times and I am grateful for the continuing support from the table tennis family, including the ETTA staff and all our volunteers. I hope that in the next newsletter I will be able to report more positive news and that Sport England will acknowledge that the ETTA has changed direction and is now on the right road. If that is the case, then I am hopeful that our sport will be rewarded with some financial security for the future. .....Liam Pitchford who has reached number 54 (up from 125 the previous month) in the latest ITTF World Rankings, following excellent performances against world class opposition in the Poland and German Opens. Best wishes for Christmas and the New Year to all our members, volunteers, officials, partners and staff. A few weeks ago I sent the first newsletter to members of the ETTA with the promise that I would keep you informed about developments which affect table tennis in this country. Since then, we have been working to ensure that we present the best possible case to secure our future funding with Sport England and to make English table tennis a sport fit for the 21st century. This newsletter brings you up-to-date with events of the past few weeks. As before, we will keep the content of the newsletter quite short, but will point to where further information on each article can be found on the ETTA's website. My first newsletter as Chairman outlined the changes and challenges which our sport is facing. I made no secret that Sport England, our main funding body, has clearly set the parameters for us to continue. We need to modernise ourselves as a sports governing body and the way we approach the promotion and participation of table tennis in England. £8 million of funding for the next three years is at stake - with possibly more in the future. Part of this process is to relocate the ETTA from our current offices in Hastings, which are due for demolition next year, into a sports complex fit for the future. close to or with another national sports governing body. I am pleased that the Board has unanimously supported the decision to relocate to Milton Keynes which meets all of our requirements. We will be partnering with Badminton England and possibly another sporting body to move into a purpose-built location which, as well as acting as our administrative head office, will have table tennis facilities for small and national events, training camps with overnight accommodation, and conference and meeting rooms. This will give table tennis a home and a focal point to develop our sport for the future. The advantage is that we are 'in' at the planning and development stage and can influence this new-build to match our requirements. The disadvantage - and I believe it is a small price to pay - is that we will not be able to move there until 2015. In the meantime, we will find suitable interim accommodation in the Milton Keynes area. In line with this relocation and modernisation, we are also looking to the future in terms of restructuring the way table tennis is run in this country. In order to have a focused and targeted approach we need to have larger teams operating in larger regions. We are looking at how these are defined and how we can utilise our resources to maximum effect. This is still a 'work in progress' and I will report back to you on our progress. Our staff have been kept informed about these developments and we are working through possibilities within departments and with individuals. I am grateful for their professional approach to these changing times and the support we have received to date. The decision to move to Milton Keynes and the restructuring plans are the beginning of a long journey we are undertaking to make English table tennis a sport fit for the future. There is much work to be done and changes are inevitable and necessary. Sport England has made it clear it will not be providing our future funding unless they see change for the better. We have certain targets to hit and I am determined we will not only hit them but surpass them. But this will not happen overnight. I will keep you, as our members, informed of developments and progress throughout the coming months. There is an Executive Summary of the recent National Council meeting on the ETTA website here. Individual membership can be renewed online or you can telephone the ETTA on 0845 0500 388 for assistance. It is important that we keep an accurate record of players and we have had some reports that some Leagues are allowing non-affiliated players to play which breaches ETTA rules. For more information about membership click here. Our junior and young players are continuing to make significant progress at home and abroad and it is encouraging for the future of the sport to see their achievements. There was also a top class field of enthusiastic youngsters when table tennis played a major part in the Sainsbury's School Games. Tin-Tin Ho’s was selected to play for Europe at the World Cadet Challengein Slovenia, where the European team finished in second place to Asia and Tin-Tin reached the last eight in the individual event. The recent Stockton-on-tees Junior 4 star also had an excellent attendance and quality performances with Helshan Weerasinghe and Emily Bolton taking the main events. European Team Championships: England men's and women's teams were on duty at the European Team Championship in Vienna. Our women's quartet of Joanna Drinkhall, Kelly Sibley, Hannah Hicks and Tin-Tin Ho were unfortunate to narrowly miss promotion to the Championship Division with a third place the Challenge Division. The men finished on a positive note as 18-year-old Sam Walker’s secured a double victory to help England finish in 19th place following a 3-2 win against Serbia. Latest Grand Prix: The Grand Prix programme continues as players from Wales and France continue to dominant their respective men's and women's singles events. Welsh no. one, Ryan Jenkins won his third consecutive Grand Prix with victory in the Tees Sport Newcastle Grand Prix to add to his triumphs at Liverpool and Guildford. While French defender, Sarah Berge prevailed once again at Newcastle as she had done in the first Grand Prix of the season in Liverpool. However, congratulations must go to England's young prodigy, 15-year-old Tin-Tin Ho who secured her maiden Grand Prix title at Guildford. Full report on Tees Sport Newcastle Grand Prix here. Full report on Bribar Guildford Grand Prix here. ..... England's Sam Walker (18) on being selected for the World Junior Championships in December. .....two table tennis officials, Joshua Reynolds, who won the Young Official of the Year award, and Tony Chatwin, who picked up the Lifetime Achievement Award at the Sports Officials UK (SOUK) awards recently. Martin Perry, a member of GB Para Table Tennis Pathway Squad who is one of five young people who have been chosen by BBC Television’s The One Show to take part in this year’s Rickshaw Challenge for Children In Need. A fantastic and enjoyable day was had by all at the Arnie Lewis Championship. The club’s 2013 tournament took place on Sunday with a record number of entries. There were 3 firsts; the first full day event (in previous years the competition has been held over 2 evenings); the first time we have had divisional events; and the first time that we have had the Arnie Lewis trophy for the open event. Arnie Lewis, who passed away 3 years ago, was a long time member of the Judean TTC. He was always available to help out in any capacity that he could and captained a number of teams over the years. He always encouraged, never criticised and was the perfect club member. Marilyn, his wife, was present to present the trophy and was delighted to see his memory live on in the club he loved. It is fitting that his son, Ivan, was the first winner of the Arnie Lewis trophy beating Richard Abrahams in the open finals. However, there was nearly an upset in the semis when Ivan struggled to beat Liang in a close 5 setter. In the consolation final Richard Dapin beat Julian. The division 3/4 finals was one of the best matches of the day with one of our junior players, Joel, beating Michael Kessler in another close 5 setter. Drew beat Dennis in the consolation finals. The division 5/6 final was won by Cyril who beat another Junior, Omraj, who is playing in his first season of competitive table tennis. Ashley beat Geoffrey in the consolation final. Thanks go out to everyone who took part and made the event a success. winner and runner-up didn't get one!!!! Apart from that it was well organised. As the new Chairman of the ETTA, I am sending you the first newsletter of what will become a channel of communication for news about table tennis in general, and developments within the ETTA in particular. We will keep the content of the newsletter quite short, but will point to where further information on each article can be found on the ETTA's website. Last year table tennis was one of the six sports out of 46 where Sport England withheld funding. We were only guaranteed a year's funding and were left in no doubt that changes and improvements had to be made in order for financial support to be available beyond next April.